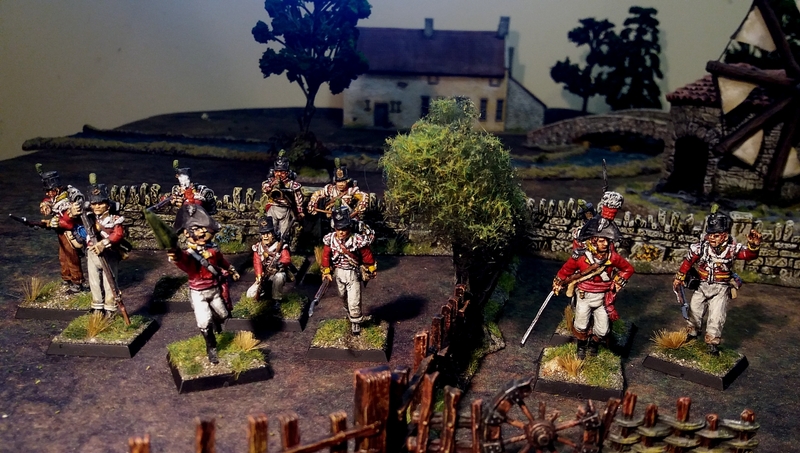 This is the second of two ‘On Parade’ articles featuring my 40mm Napoleonic figures. This time we look at the French. 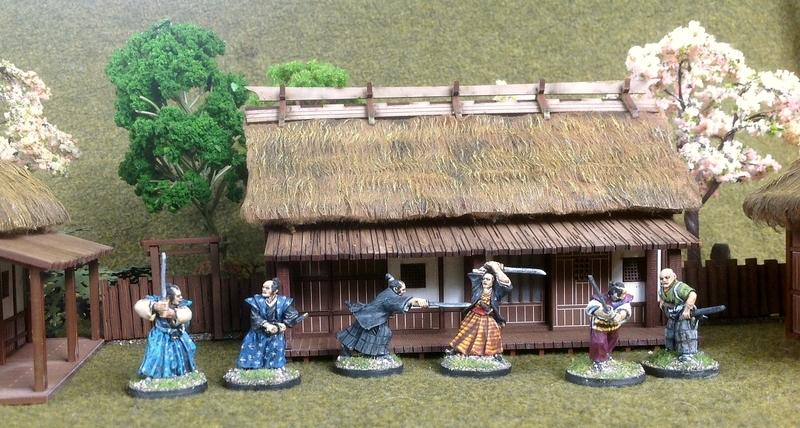 These are a mixture of Perry Miniatures and Sash and Sabre figures. The shako numbers indicate that these men are from the 85ème Régiment d’Infanterie de Ligne. I picked this particular regiment because back in 2005 my son and I were invited to participate with the recreated 85ème in a reenactment of the Battle of Waterloo. 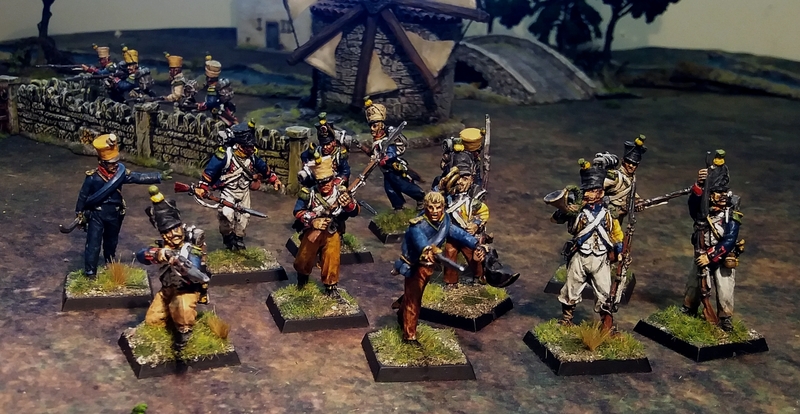 Here’s my entire French contingent – a unit of grenadiers, and another of volitguers. 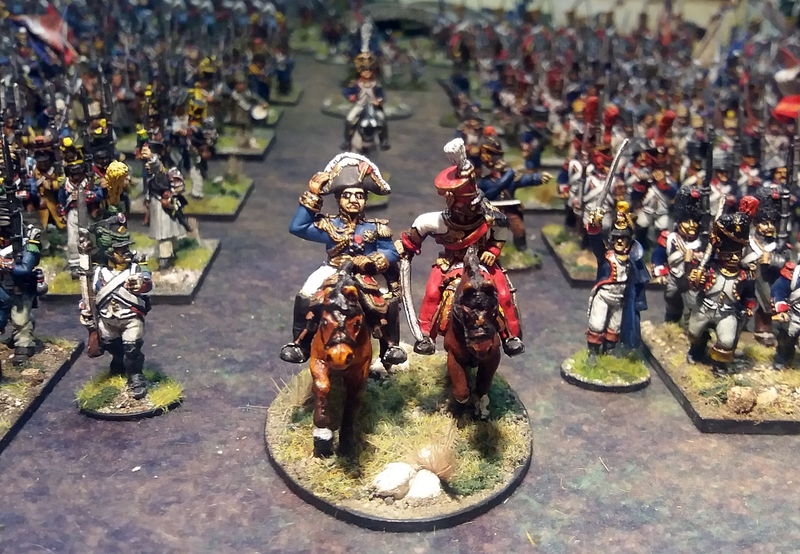 This is the last of the Napoleonic postings for ‘On Parade’. Next time I’ll be featuring something completely different from my wargaming collection. See you soon! 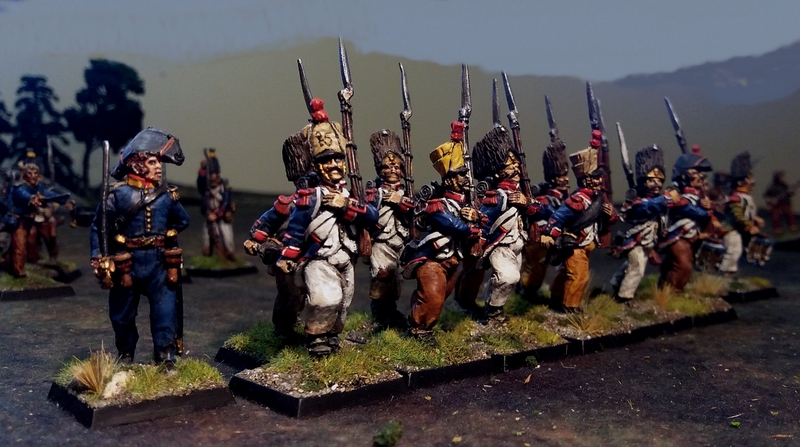 In my last ‘On Parade’ article I mentioned that the next posting would still be Napoleonic, but a little bit different. Well, here we are, and the difference is that these aren’t my usual 28mm figures. 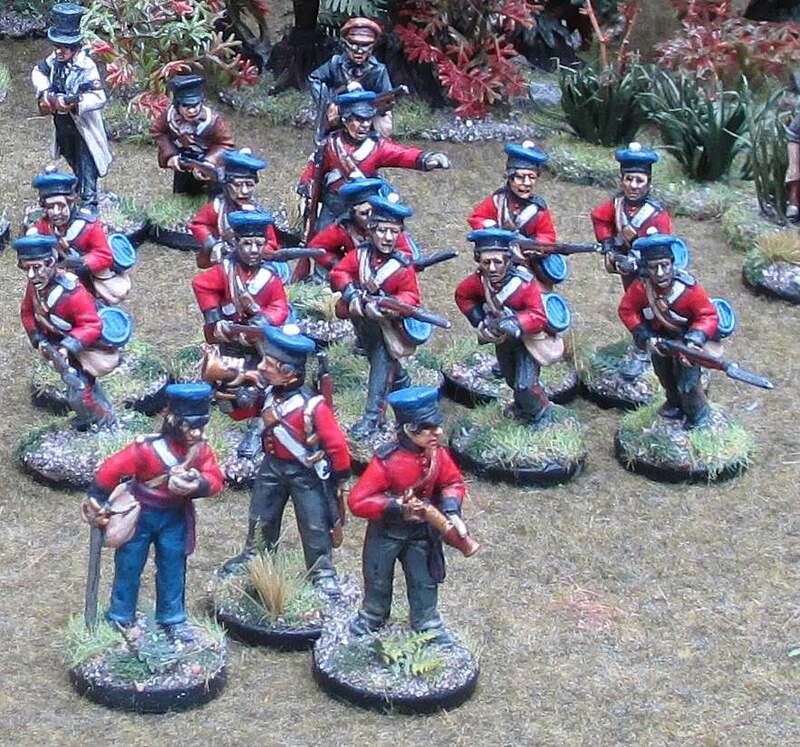 Back in June 2008 I bought a few of what was then a relatively new line from the Perry Miniatures – 40mm tall Napoleonic figures. I was impressed at the excellent sculpting, realistic posing and fine detail of these lovely models. Each figure seemed to have a character and personality of its own. 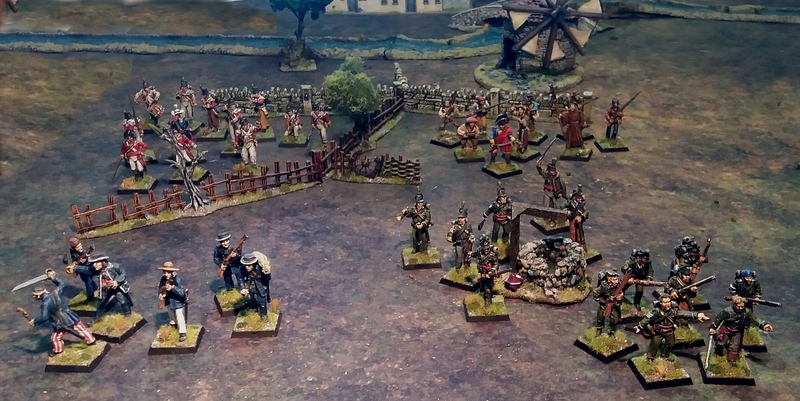 I eventually added a more figures by other makers (including some rather Sharpe-ish figures). 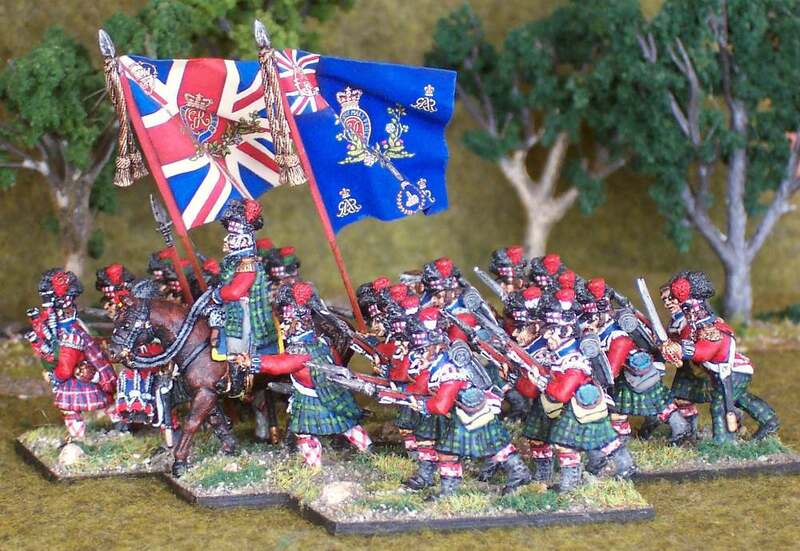 These ranges included the Honourable Lead Boilersuit Company, Sash and Saber, and Trident Miniatures. 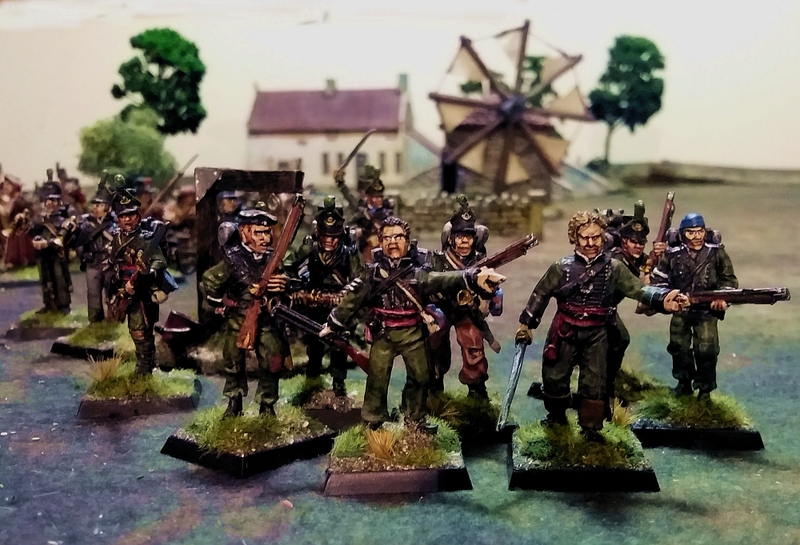 Sad to say, I never progressed any further in actually playing with these 40mm figures than in one test skirmish game. 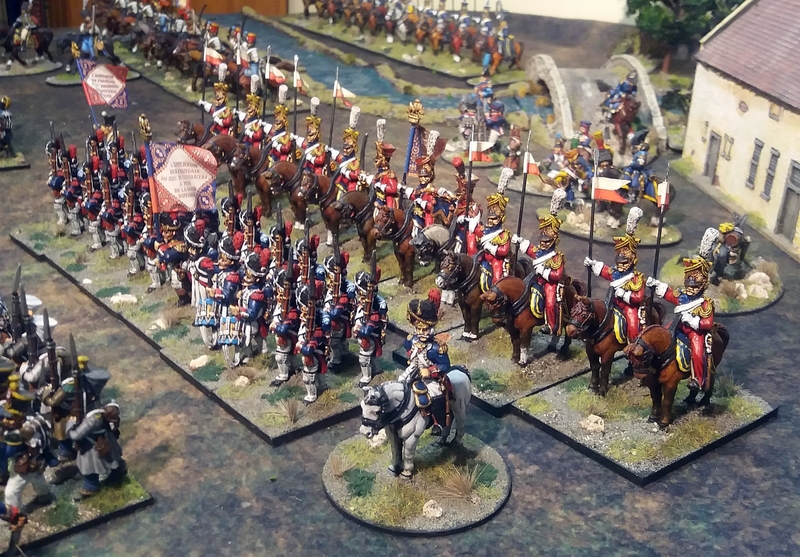 But truth to tell, many of my other wargaming units seldom get to face battle on the tabletop either, as I game so infrequently! 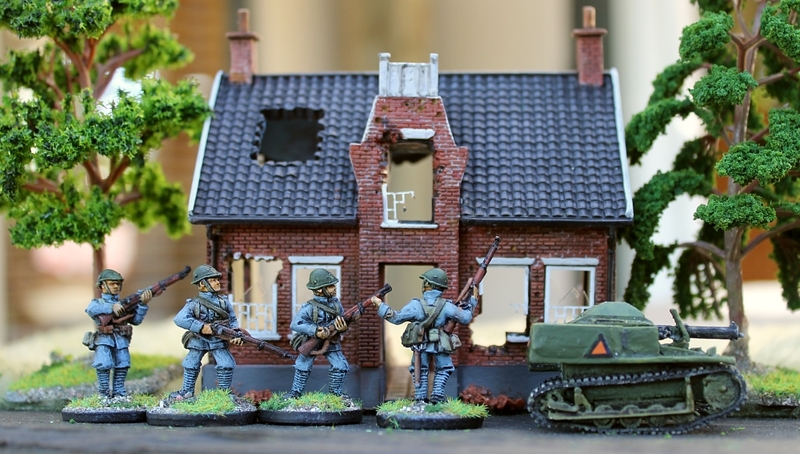 One issue that did emerge during our sole play-test with the 40mm figures was that they could only be used on a flat battleground. 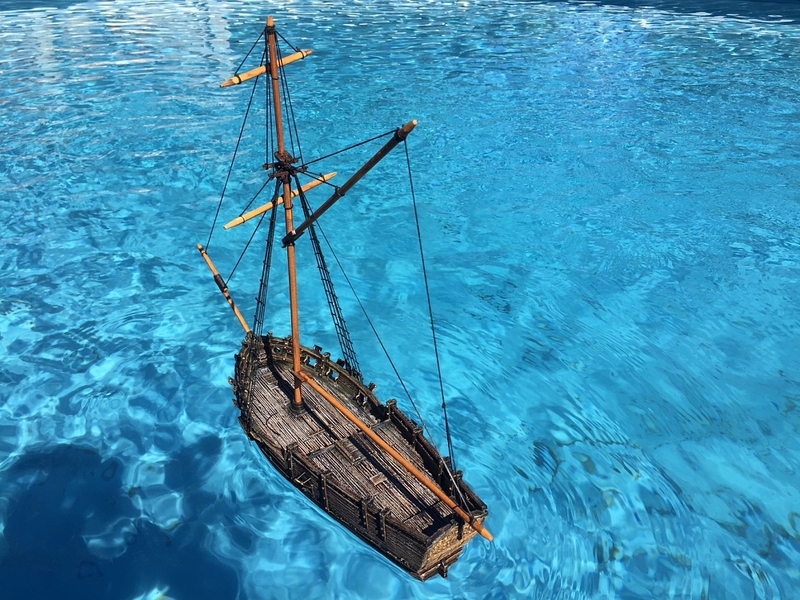 I had made the mistake of glueing them onto such light plastic bases that their height and weight caused them to become top-heavy, and they continually fell over at the drop of a hat. But even though they haven’t been gamed with much, I really enjoy the look of these figures, and they form a treasured part of my overall model soldier collection. 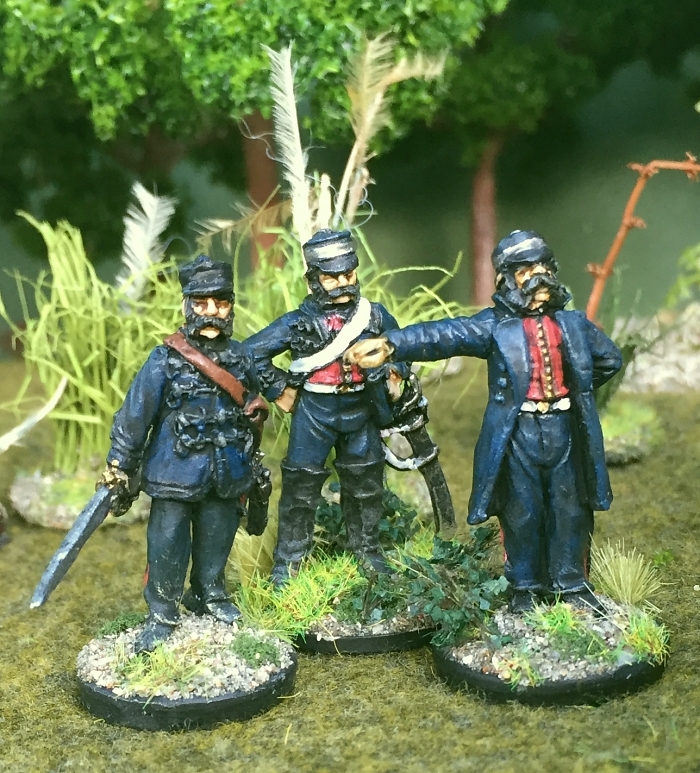 In this first of two ‘On Parade’ articles about my 40mm collection, let’s look at the British and their Spanish allies. 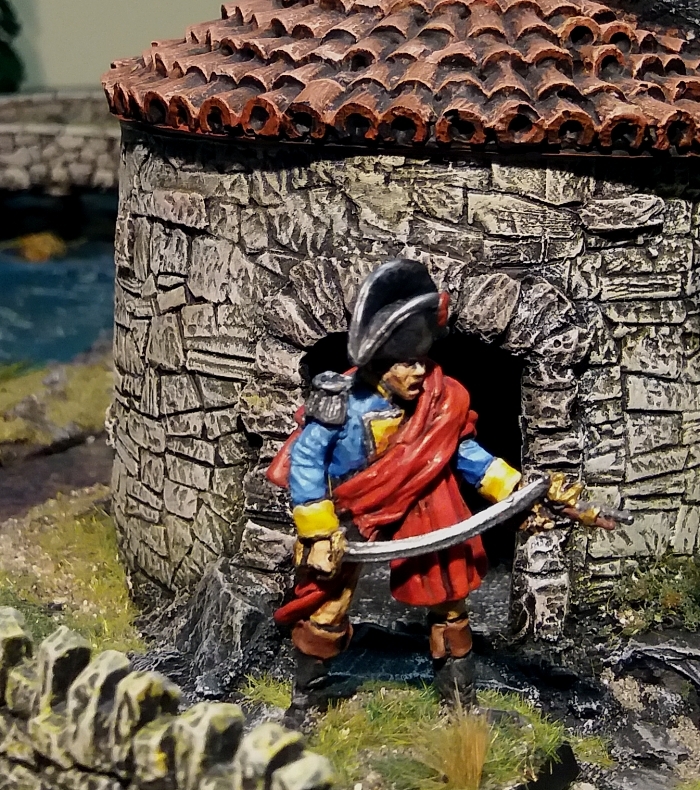 By the way, the windmill in the background of many of these photos is a resin Grand Manner piece that really sets the scene for any Peninsular War game. The walls and fences are by Games Workshop (Warhammer). 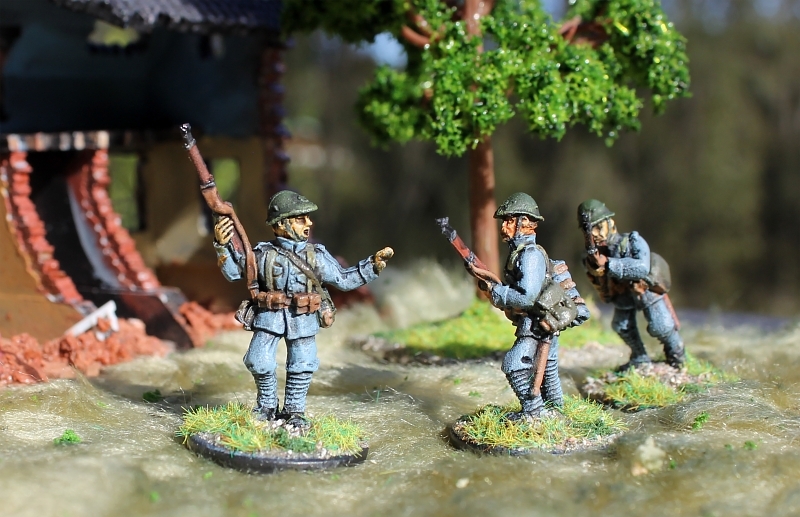 All these scenic items are actually designed for 28mm figures, but as you can see they work well enough for 40mm as well. As usual, click on the pictures if you want to examine them more closely – but prepare to be shocked by my rather impressionistic painting style that looks good from a few feet away, but very messy when seen close up! 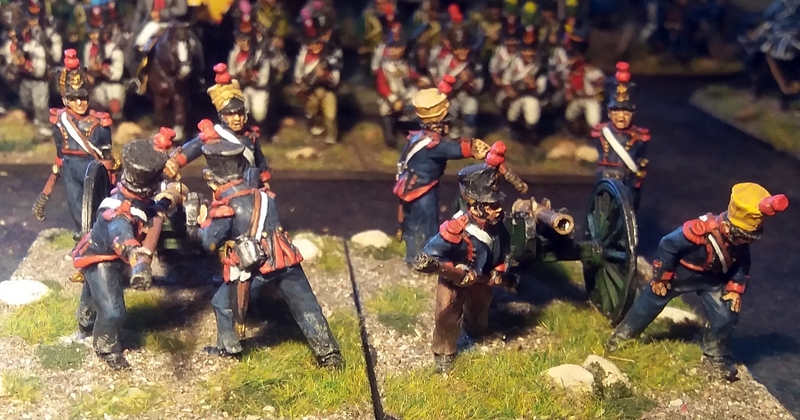 The next ‘On Parade’ will feature my 40mm French collection. See you soon! 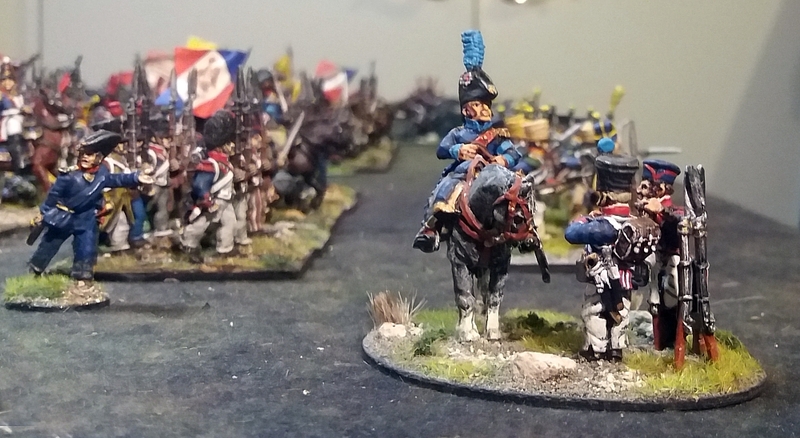 A French army on the march always had a long tail of camp followers. There were the wives and children of soldiers following their spouse or parent’s army from place to place. You would also find the many informal army service providers, selling goods or services that the military did not supply—cooking, laundering, liquor, nursing, sexual services and sutlery. And of course there were the ne’er-do-well soldiers, stragglers and walking wounded. 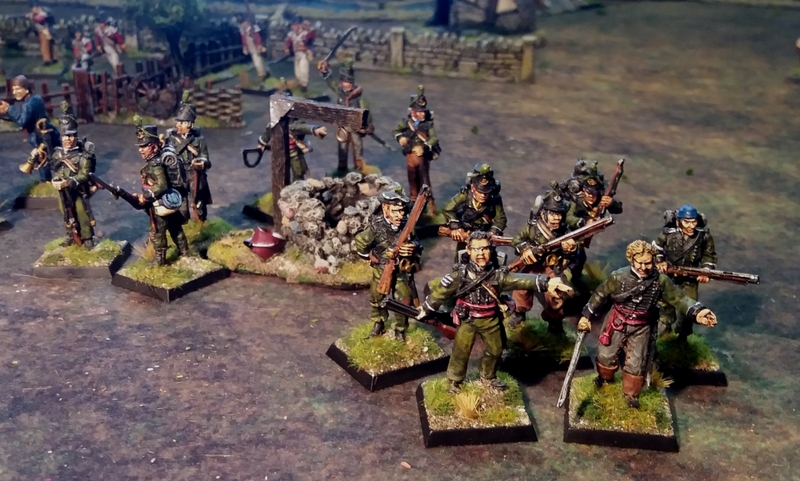 This latest instalment in my ‘On Parade‘ series shows the mini-dioramas that represent the camp followers of my French army. 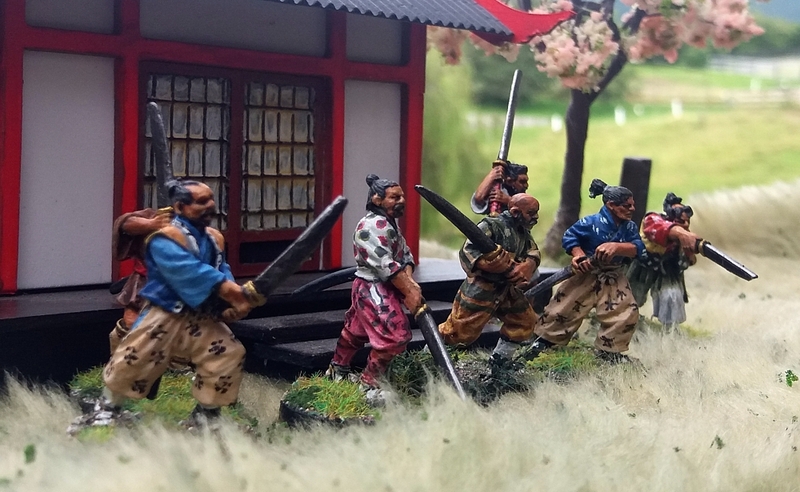 These are intended to add visual interest to the miniature battlefield, and would seldom take part in anything other than scenario-driven skirmish games. 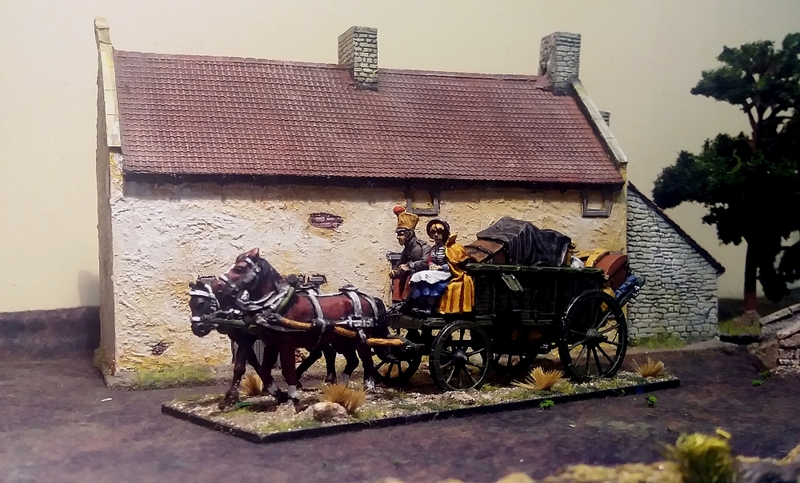 A well-laden supply wagon trails the French army on the march. This is the Perry Miniatures model, sculpted full of baggage and even including an overflowing rack at the rear. The model can be assembled either with or without the canvas tilt cover. I’ve just left it unglued, so I can choose whether the wagon will be covered or not. The wagon is driven by a soldier wearing a shako and greatcoat. He is giving a lift to a cantinière in the passenger seat. I’ve just blu-tacked these figures on so that I can remove them if I want to use the wagon for other periods. 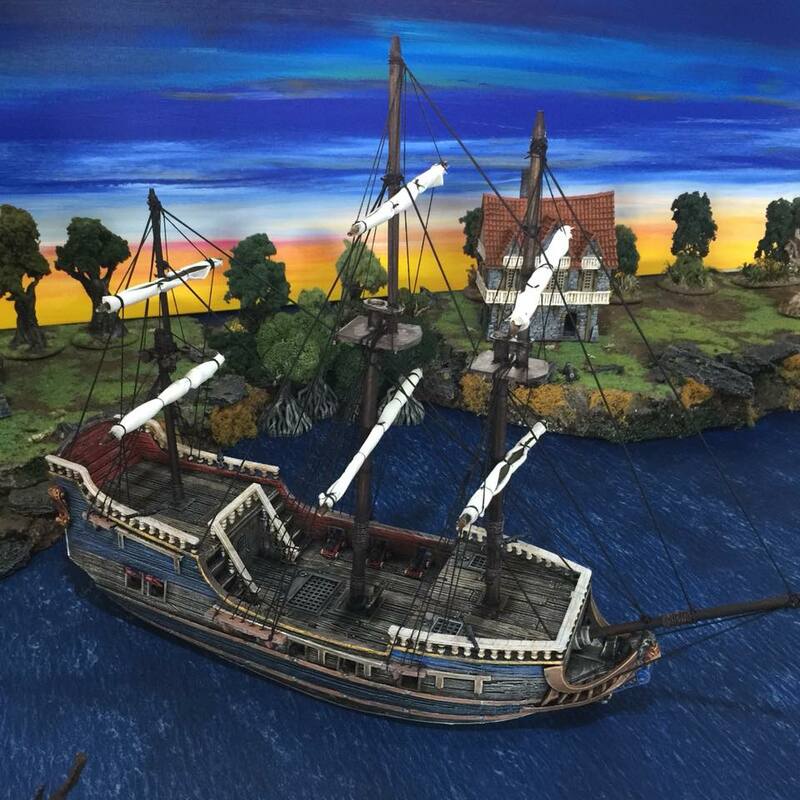 In this picture you can also see some of the Perry Miniatures civilians set. Speaking of cantinières, besides the one hitching a ride on the wagon, I’ve got another two. 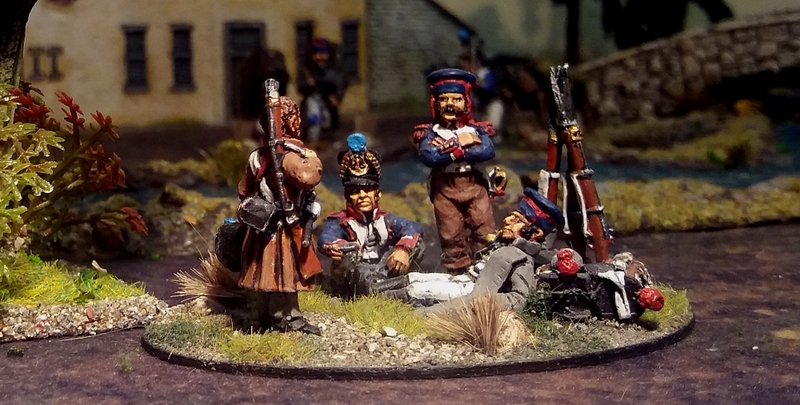 The one on the left is from Foundry, whilst Warlord Games make the running cantinière. The latter’s donkey is tied to a convenient rail, and is even carrying a bunch of daffodils in its pannier! This French campsite scene looks great placed as a decorative vignette on the table-top. The chap in a brown greatcoat looks like he’s returning to his campfire after finishing his turn of sentry duty. These figures all come from a set by Wargames Foundry. The New Zealand company Wildly Inspired make a nice line of pack horses and donkeys. In this vignette two horses are being led by a Redoubt Miniatures recruit, or ‘Marie-Louise’ as the recruits were nick-named. He wears an over-large greatcoat with a rope belt, patched trousers, fatigue cap, and wooden clogs. His musket strap is made out of string. At the right is a rather relaxed looking Foundry infantryman with two pack donkeys. One of the donkeys is carrying a body in a bag—there must be a great story lurking behind this model to drive a scenario-based skirmish game! 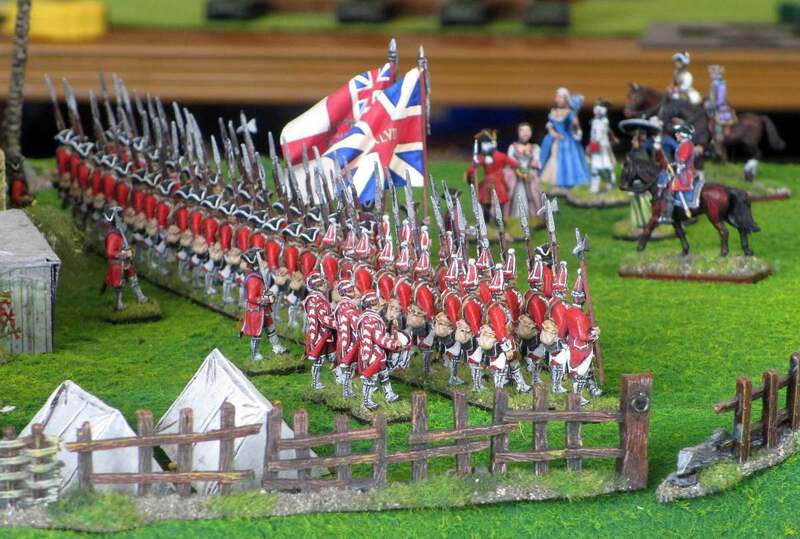 My series of ‘On Parade‘ postings continues, as I inspect all the wargames figures I’ve painted over the last 20 years. 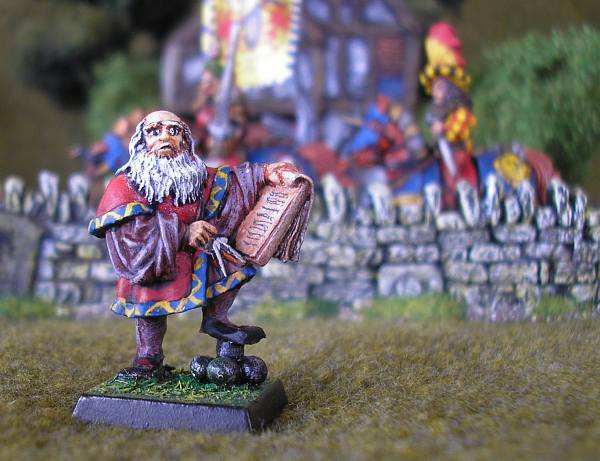 Just like a real army, a wargaming army needs generals and staff. Most wargames rules incorporate rules for commanding officers to lead and rally their men. 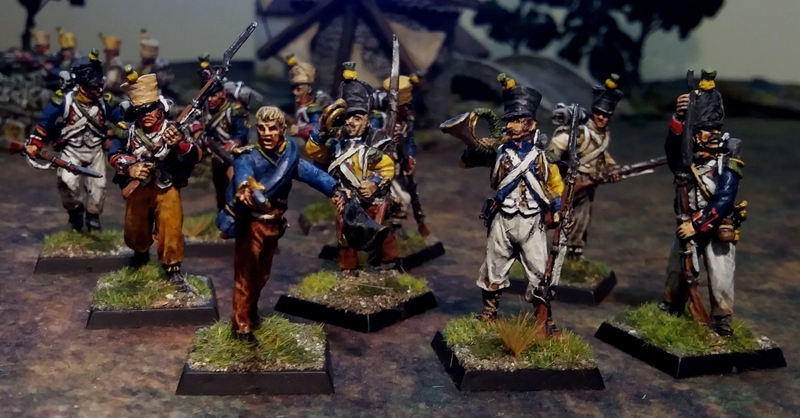 Though that’s a moot point for me, because my French army has only actually played a couple or so times since I painted these figures in the early 2000s – I’m more of a painter than an actual gamer! Here’s Marshal Berthier, along with his ADC, Baron Lejeune. These are both Front Rank figures. Berthier (left) is a standard personality figure from their range. 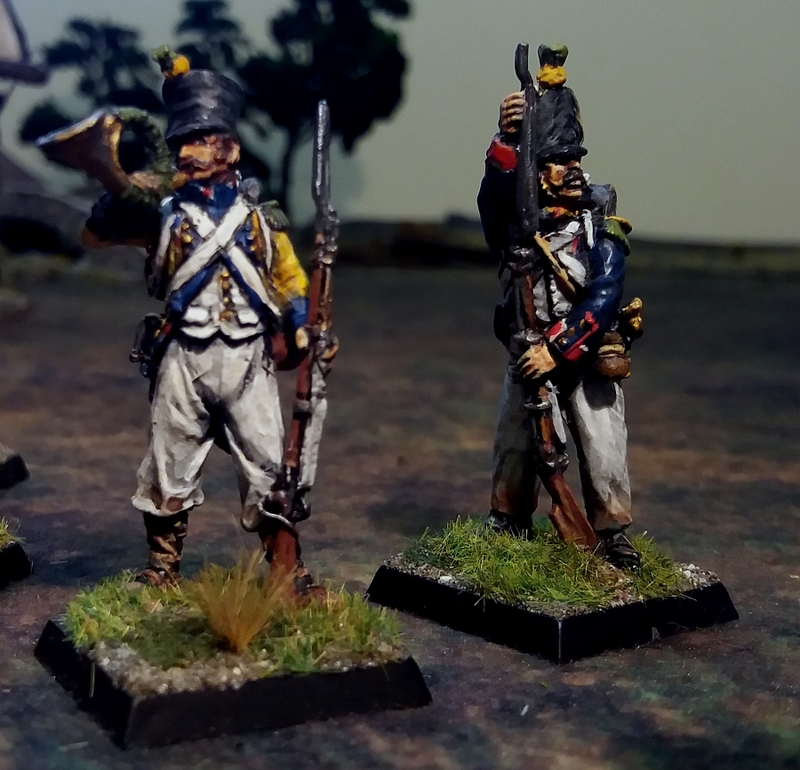 But his ADC started life as a model of a Chasseur à Cheval of the Imperial Guard, which I painted in the highly individualistic uniform of Berthier’s aides. It is said that Berthier would allow only his aides to wear red trousers, and got very angry if he saw anyone else wearing this colour. Berthier must’ve sometimes got angry with Marshal Grouchy though, as he clearly wore red trousers, as seen here! Grouchy is accompanied by a general in chasseur uniform. I particularly like these figures, as their colourful uniforms make a change from the more usual blue uniforms of the French staff. 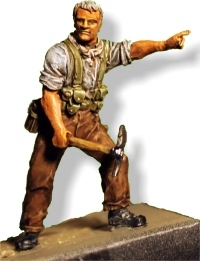 These are lovely 28mm Front Rank castings from their range of personality figures. 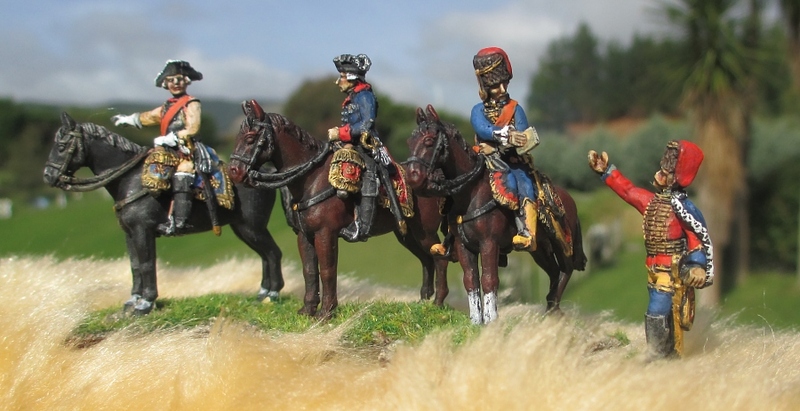 Behind them is a Perry Miniatures figure of an ADC in the act of mounting his horse – a rather unusual pose. Here are some more of Front Rank’s range of wonderful personality figures. On the left is Marshal Soult, wearing a cloak slung over his left shoulder. On the right is a general wearing his greatcoat, along with his ADC. 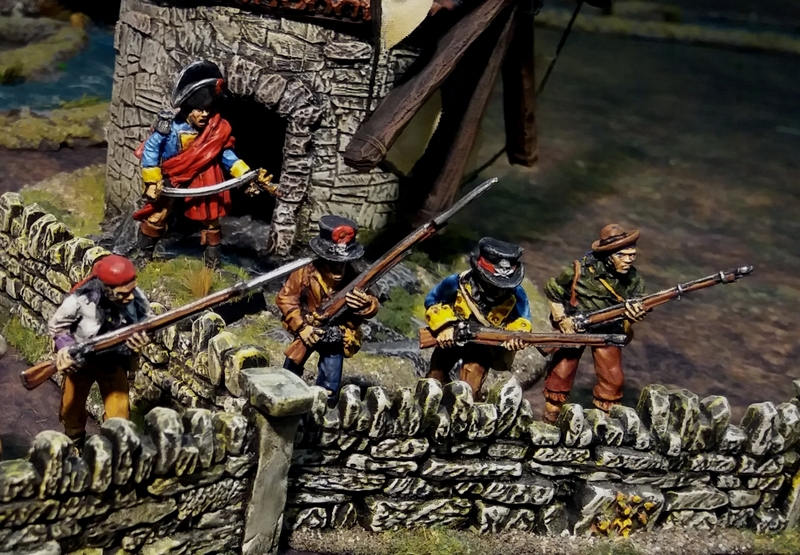 The group on the left in the above picture contains two figures by Essex Miniatures (one at the far left, the other obscured in the centre) and two by Wargames Foundry. The difference in style between these two manufacturers is obvious from close up, but is fine from the arms-distance at which you normally view wargaming figures. 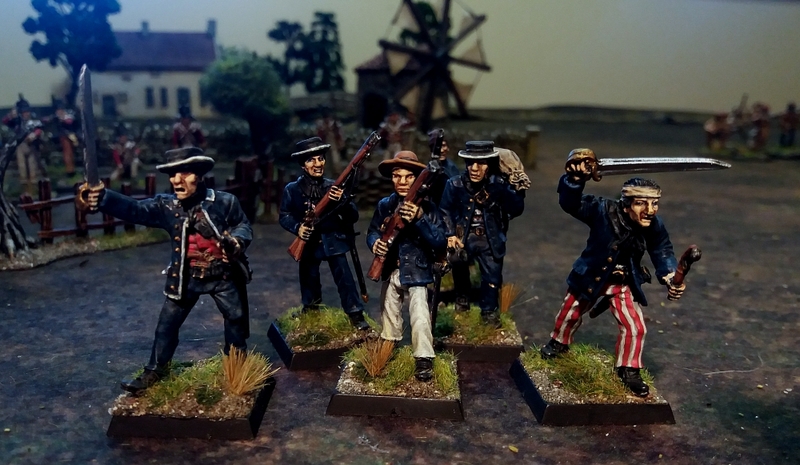 On the right is a group of Perry Miniatures’ command figures. Marshal Ney is leaning on the map-covered table, with Soult and Drouot on either side. 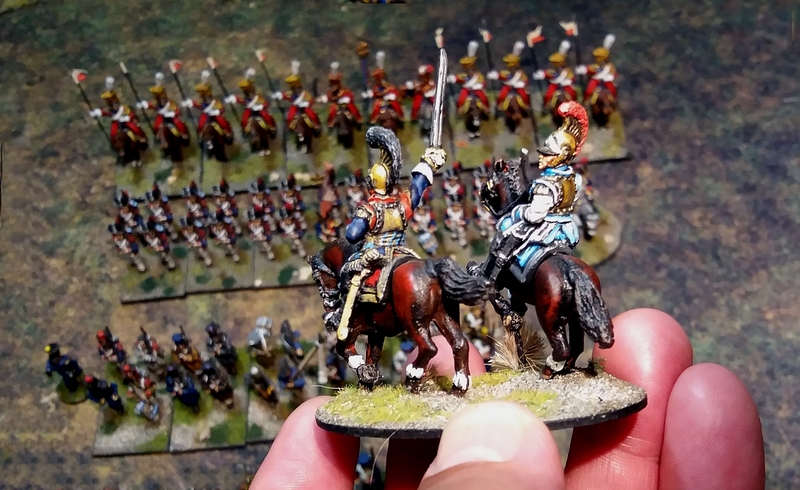 This mounted general wearing a cuirass is produced by Wargames Foundry. I like the pose of this figure, and also of his horse – they go well together. The small road-sign at the back of the base is an out-of-production scenic item that used to be produced by New Zealander, Mark Strachan. This is one of my favourite command stands. At the right is General de Brigade Chouard of the 2nd Brigade of Carabiniers. He is accompanied by an aide on the rearing horse. These are both Front Rank figures. Generals of this period always need ADCs to gallop their orders round the field of battle. 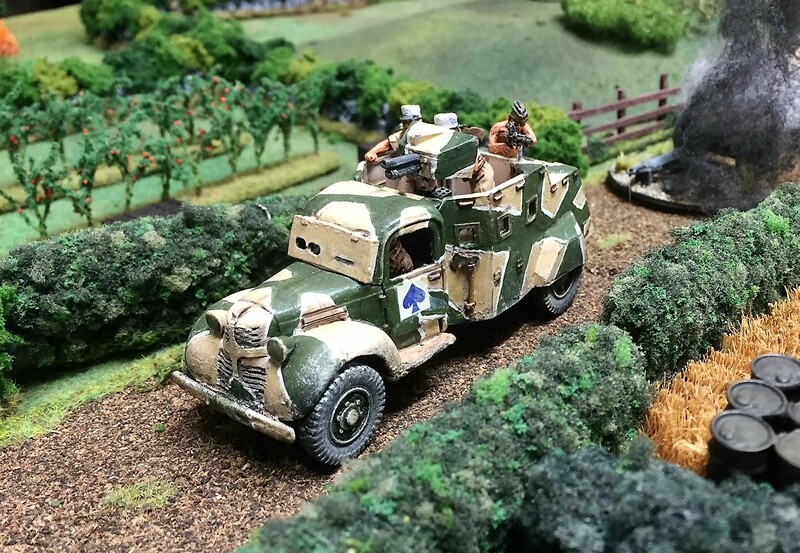 This nice mounted ADC came as part of Wargames Foundry’s French campsite set. His light blue arm-band indicates that he is the ADC to a General of Brigade. I based him as if he was asking directions from a couple of infantrymen. The above-mentioned ADC also features in this picture of a busy French campsite. 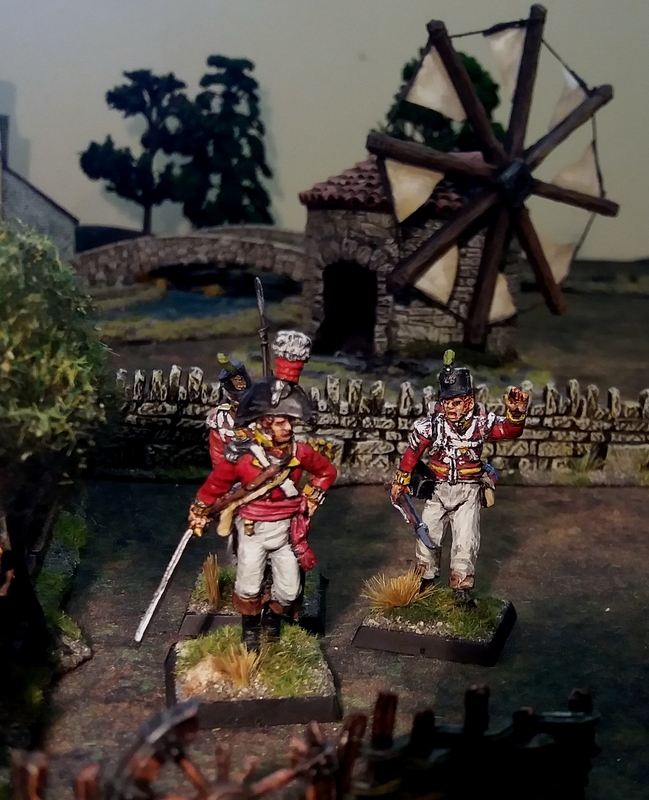 There’s also another ADC galloping over the bridge on his important mission, and yet one more introducing himself to a pair of light infantry musicians. Here’s the top man himself – the Emperor! 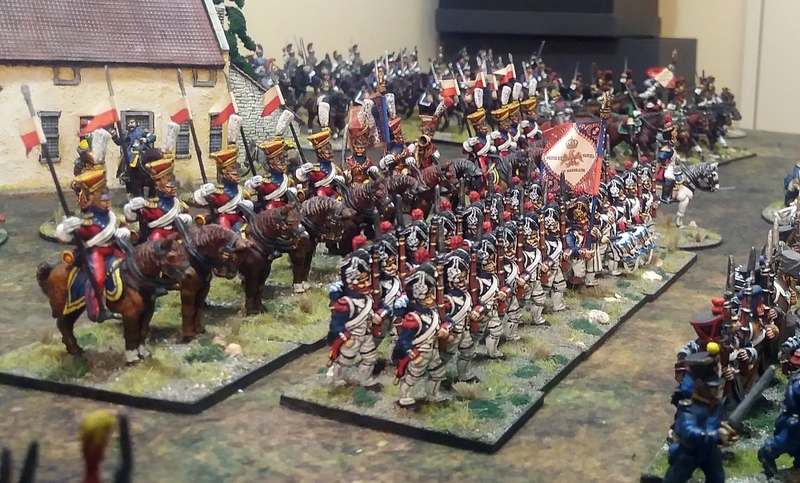 OK, yes, I know, my army is far too small to be commanded by Napoleon himself. But there are just so many tempting models of him available, they’re impossible to resist! 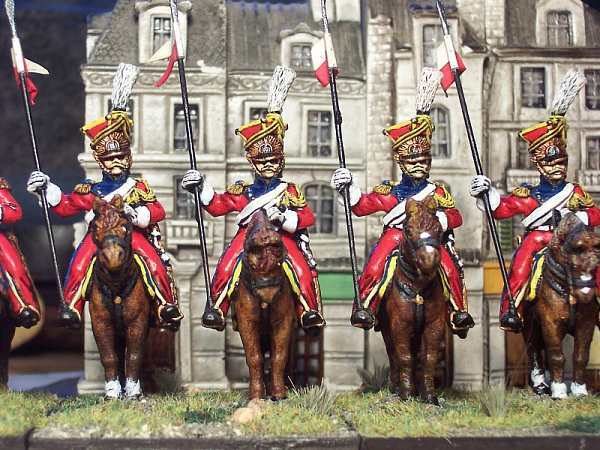 For instance, this Foundry special set depicts Napoleon and his staff (many of the figures based on the famous painting by Vasily Vereshchagin of Napoleon at Borodino). You can see the Emperor sitting on a chair with his foot up on a drum. Behind him are clustered some of his marshals, including Berthier and his ADC in hussar uniform, Mortier, Grouchy, Victor and Ney (with his red hair). 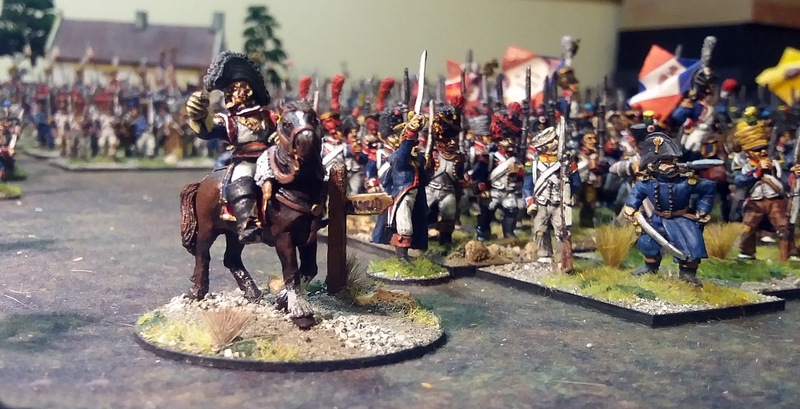 Also depicted on this large command stand are Napoleon’s personal Mameluke aide Roustam Raza, various ADCs, and (obscured) a Chasseur a Cheval standing guard. 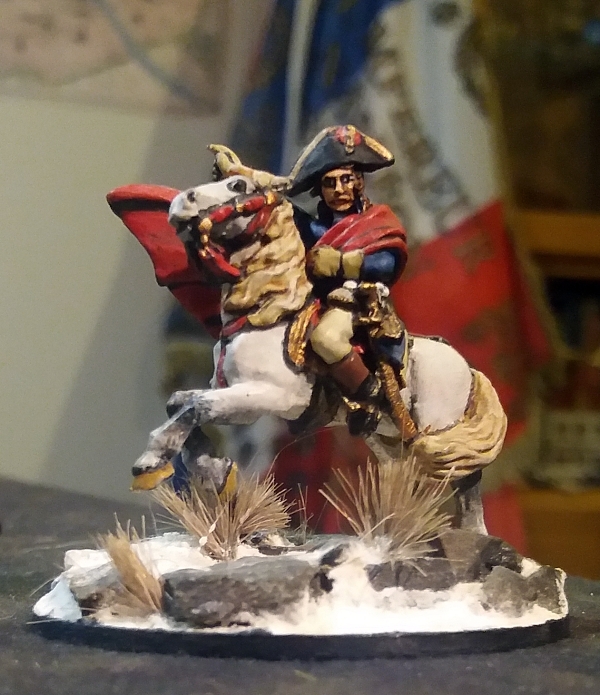 Here’s another of my Foundry Napoleons, this time based on the famous painting by David, Napoleon Crossing the Alps. As the setting is in the mountains, I have made a snowy base instead of my more usual grass and sand texturing. I used baking powder for the snow. I was worried this might cause cause unforeseen chemical reactions with my lead figure in years to come – but a couple of decades later it is holding out well! The David painting is actually a strongly idealised view of the real crossing that Napoleon and his army made across the Alps. Napoleon actually made the crossing a few days after his troops, led by a local guide and mounted on a mule. 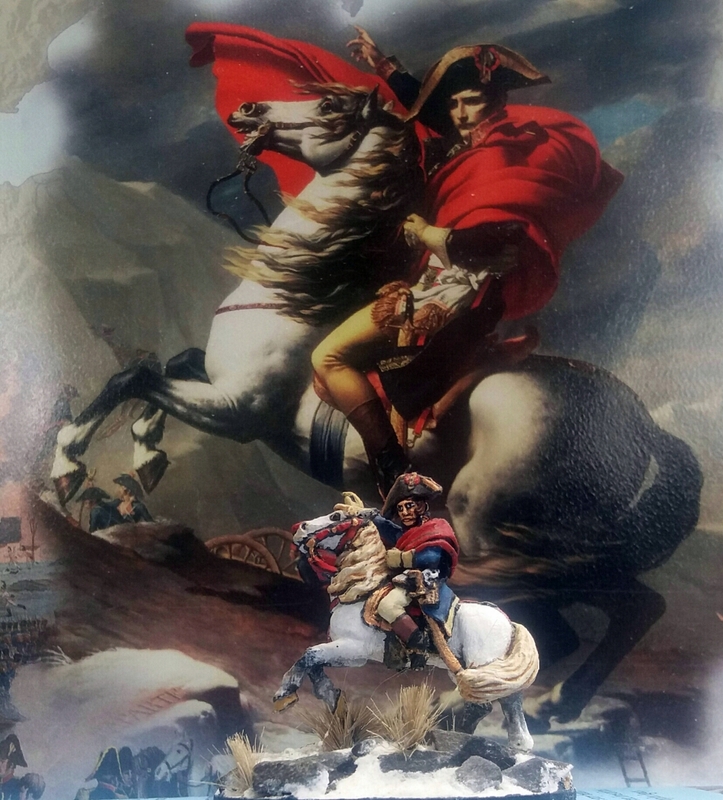 However, as this painting was first and foremost propaganda, Bonaparte asked David to portray him mounted calmly on a fiery steed. Sort of a Tinder profile vs reality! 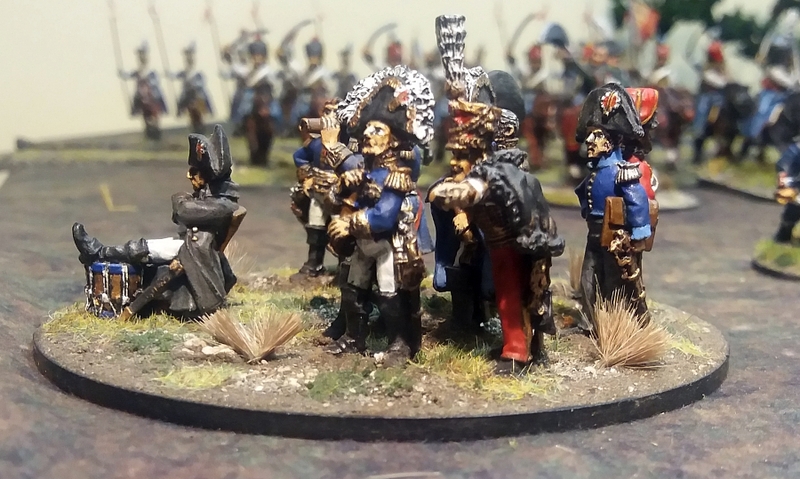 Continuing my series of postings in which I’m undertaking an inspection parade of all the wargames figures I’ve collected and painted over the years, we now come to Napoleon’s famous Old Guard. These were painted in the early 2000s. For a long time I had resisted the temptation to add some units of the Imperial Guard to my miniature army. After all, the guard would not have been present with such a small force. But, in the end, the glamour and colour of the ‘grognards’ of the Imperial Guard won me over, and I eventually succumbed! 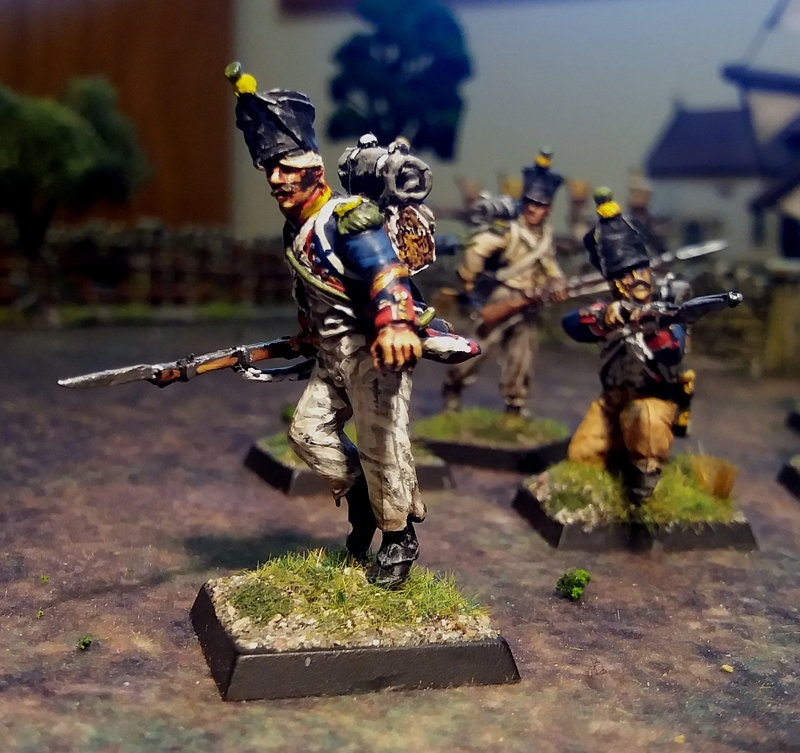 If I was going to do the Guard, why not start at the very top – the Foot Grenadiers of the Imperial Guard. These are the soldiers everyone thinks of when you mention the words ‘Old Guard’ – big bearskins, red epaulettes and plumes, long blue coats with white lapels. 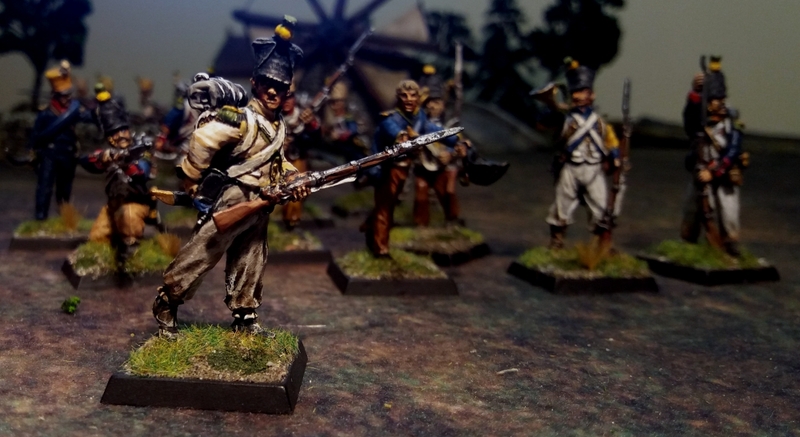 I selected Front Rank figures for my unit of Foot Grenadiers. 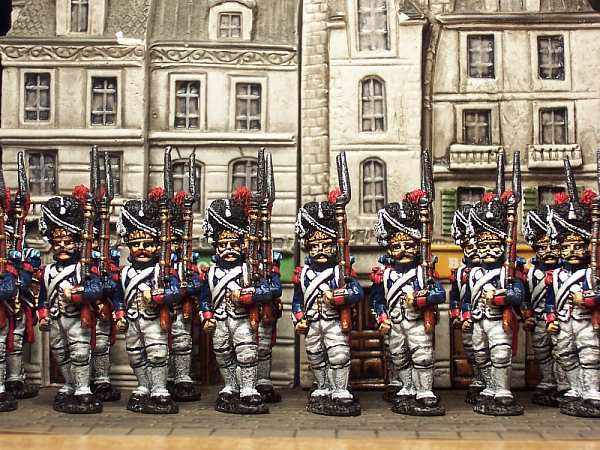 These miniatures seem to be based on the famous Detaille painting of a grenadier on guard duty, as they are in an identical pose. 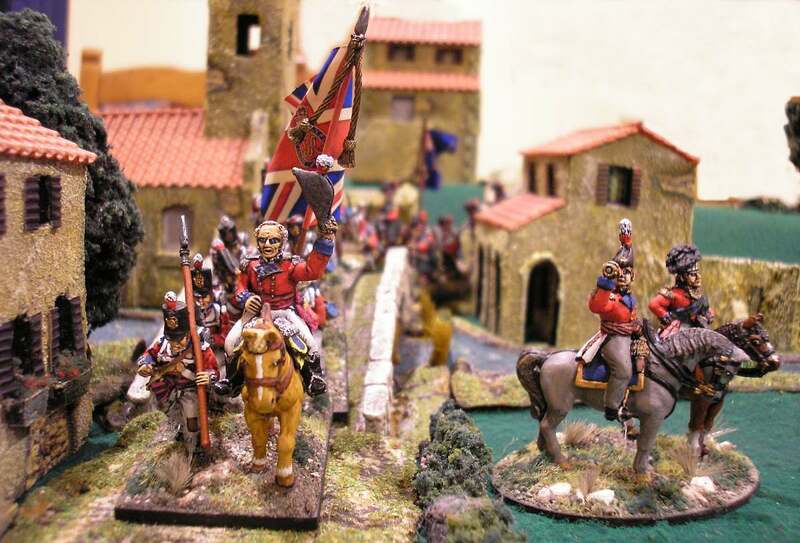 The command figures for my unit include two drummers, a sapper wearing a white apron, a standard bearer holding a GMB Design flag, and a mounted officer. 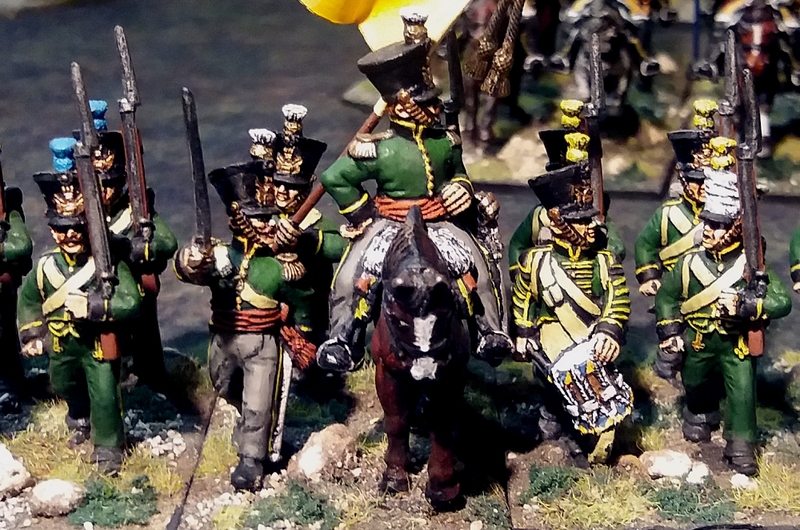 I have also painted a cavalry unit for my Imperial Guard contingent. 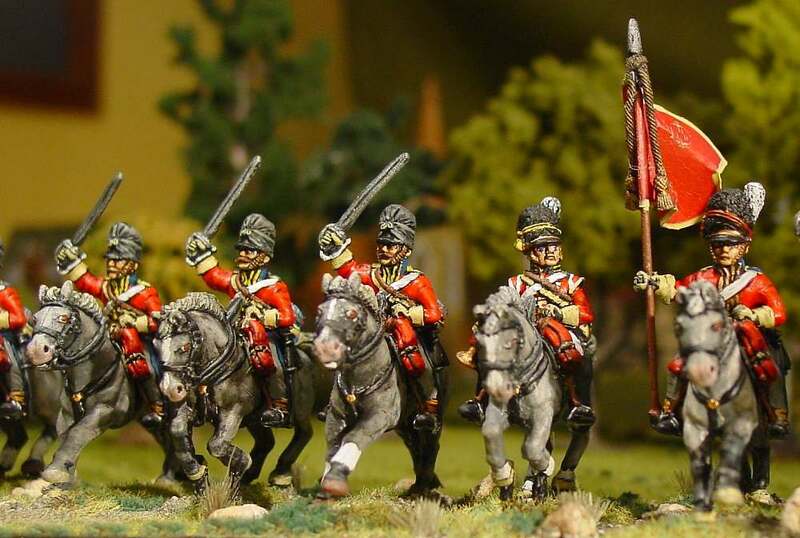 Being of Dutch heritage, it was impossible for me to choose anything other than the famous Dutch Lancers, often known as the Red Lancers, but correctly titled the 2nd Regiment of Light Horse Lancers of the Imperial Guard. 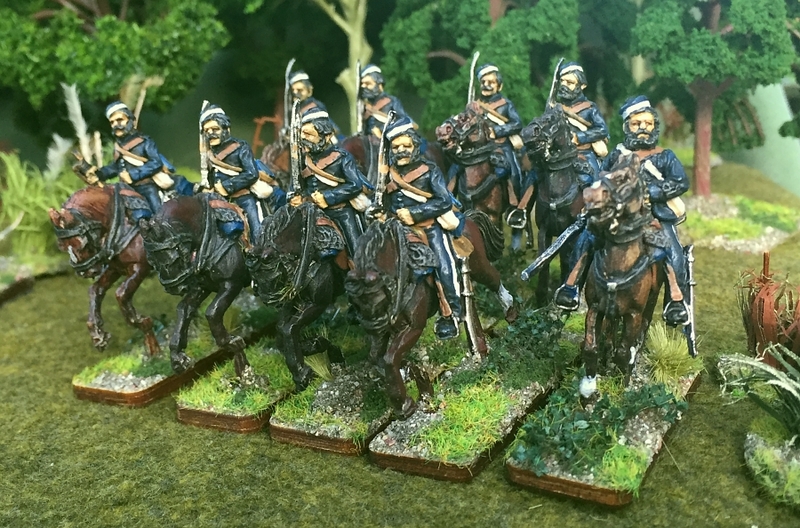 I chose to model my lancers at rest, rather than my more traditional charging cavalry pose – this was because I feel the lances look better upright than thrust forward. The pennons are by GMB Design, who also produced the flag. 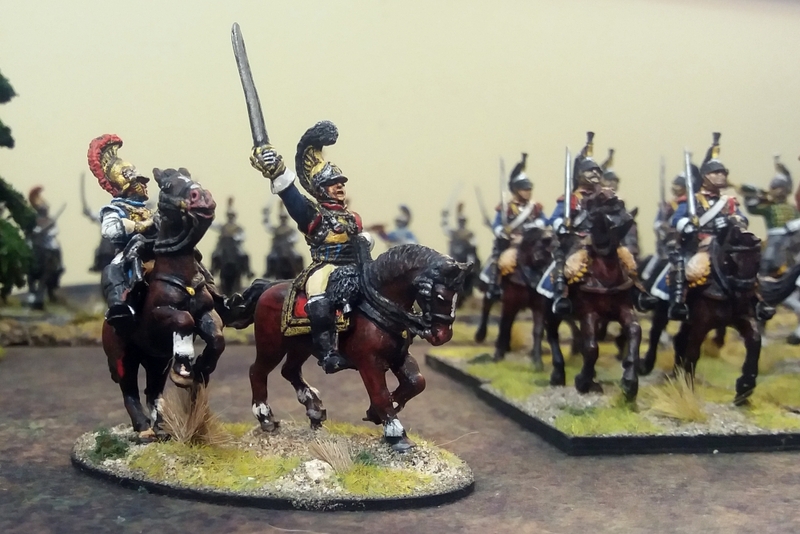 Most French light cavalry units didn’t carry their eagles into battle. But my philosophy is that I want all my units to have an attractive flag and eagle. 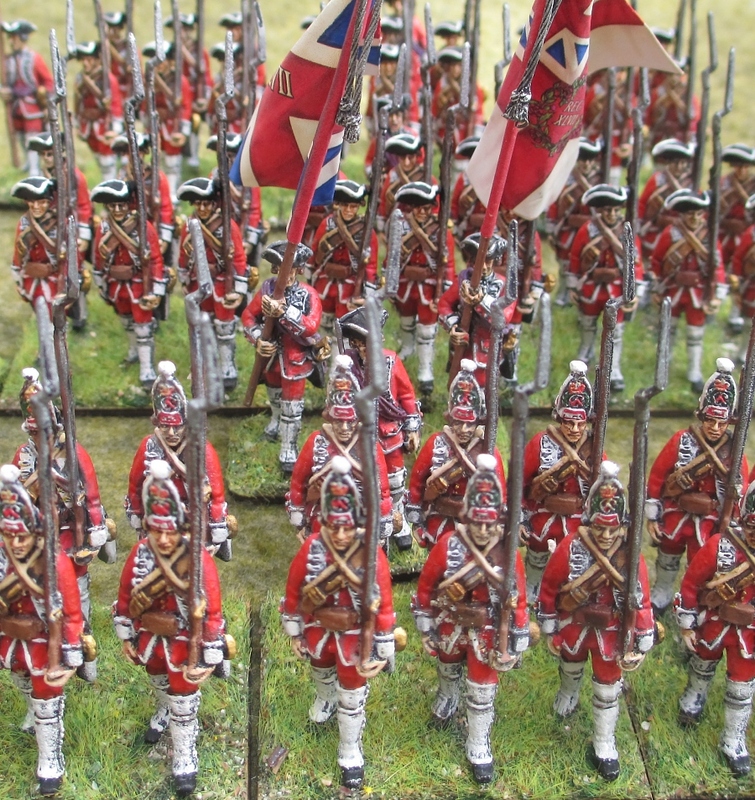 As my figures spend most of their time in the display cabinet anyway, they could be said to be depicting the regiment on parade at their home depot, rather than on campaign! By the way, the Parisian buildings in the background of some of the above photos are not wargames terrain. 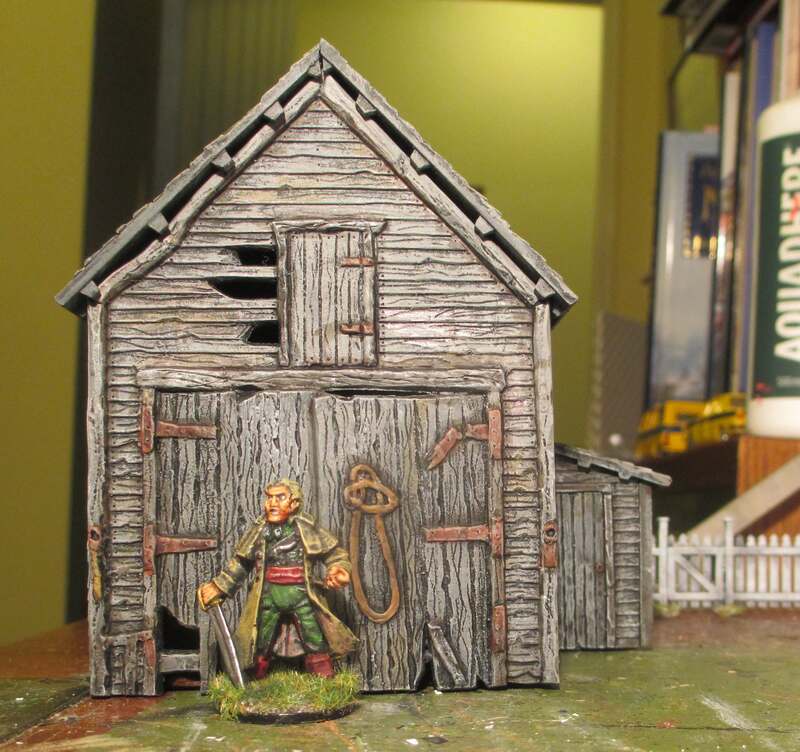 They are in fact rather expensive collectible miniature buildings from a range called Gault. My wife and I bought them as souvenirs during our honeymoon in Paris in the late 1980s! They are low-relief buildings, and far too small in scale, but still make nice photo backdrops, n’est-ce pas? 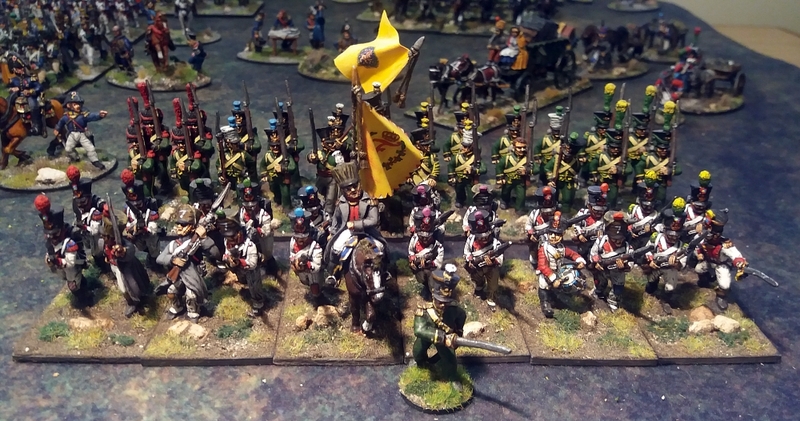 Continuing my series of postings in which I’m undertaking an inspection parade of all the wargames figures I’ve collected and painted over the years, we now come to the Napoleonic French artillery to support the infantry and cavalry. These were mainly painted between 2002 and 2008. 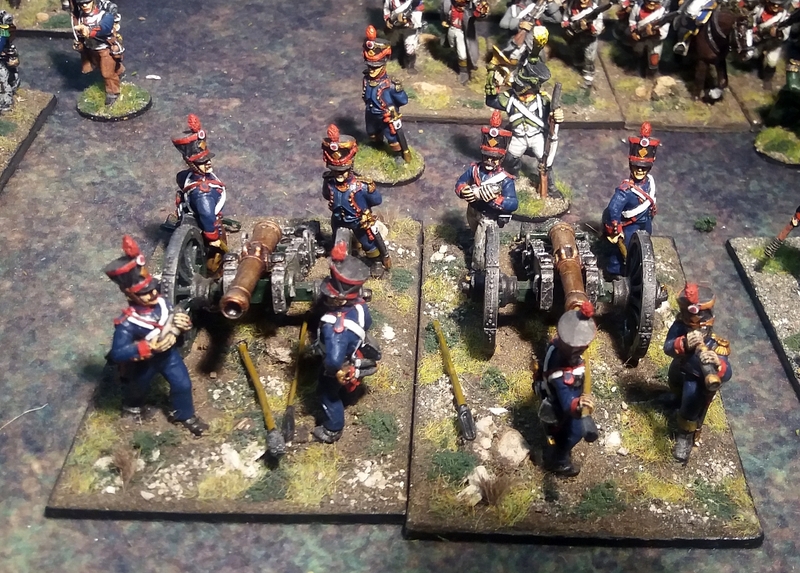 The artillery contingent of my Napoleonic French army consists of three batteries, each with two artillery pieces. 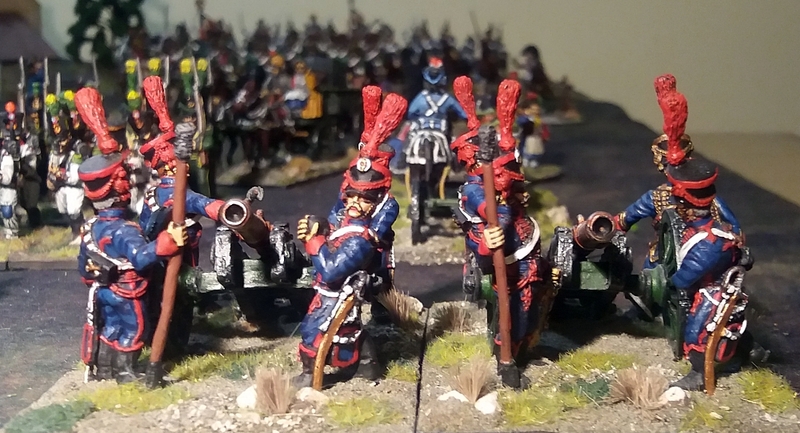 These Front Rank figures are painted in the blue uniforms of the Foot Artillery, though I have given a couple of the gunners different coloured trousers to indicate campaign conditions. I found the best way of representing the bronze gun barrels was to leave them unpainted metal, but rub on and immediately wipe off several coats of brown ink. This eventually stains the metal a bronze colour, as well as picking out the cast-on detailing. The gun carriages are painted dark green, with the metal work done in black and then dry-brushed with gun-metal silver. I had a few spare rammers and other tools, so I’ve glued them lying on the base underneath the guns. One of my only criticisms of the superb Front Rank gunners is that they are hard to arrange on their bases performing the same part of the loading and firing sequence. Thus you have the gun being loaded, but meanwhile one gunner is just about to touch the linstock to the vent! 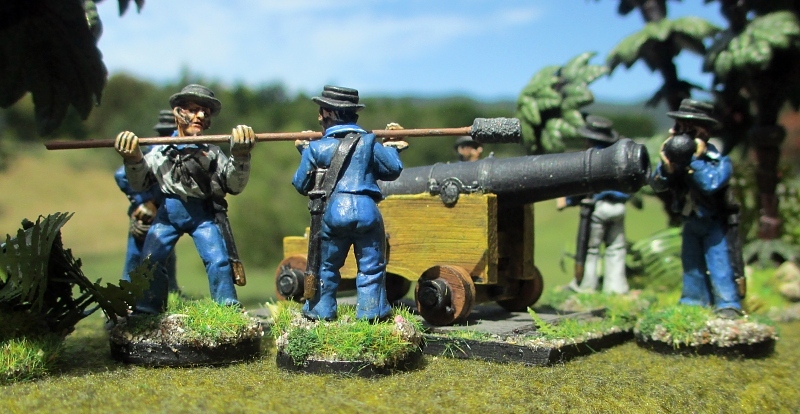 When I later added a Perry Miniatures Foot Artillery 6-pounder battery to my army, I was pleased to find that they sculpt sets of gun crew all performing a particular part of the sequence. The result is a lively action-packed base where you can tell exactly what’s happening at that frozen moment in time. Front Rank make this wonderful set of Horse Artillery of the Line, with the gunners in full dress, complete with huge red plumes and lots of braid. 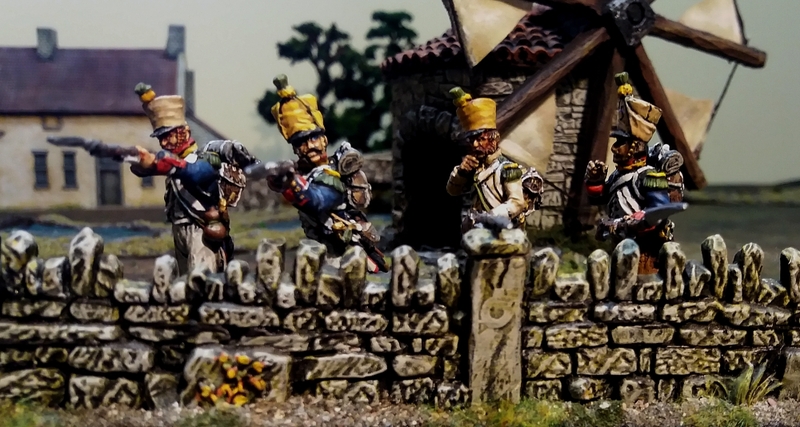 These lavish uniforms are fun to paint, and certainly look dramatic on the table. 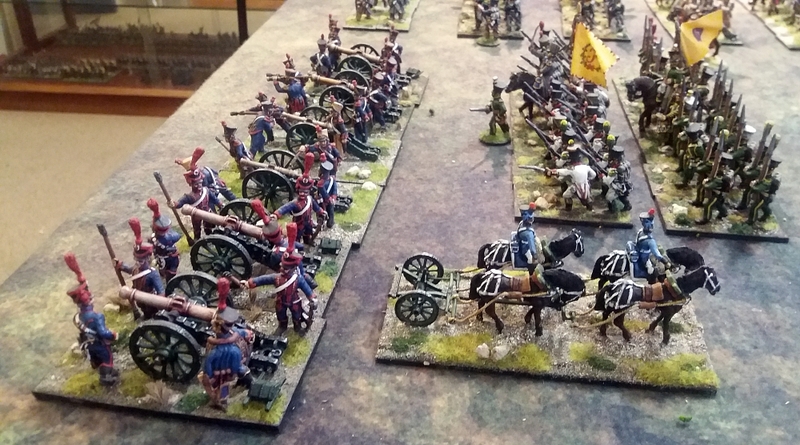 My artillery only has one limber model, mainly due to the expense of such intricate models that are ultimately not much use for wargaming purposes. 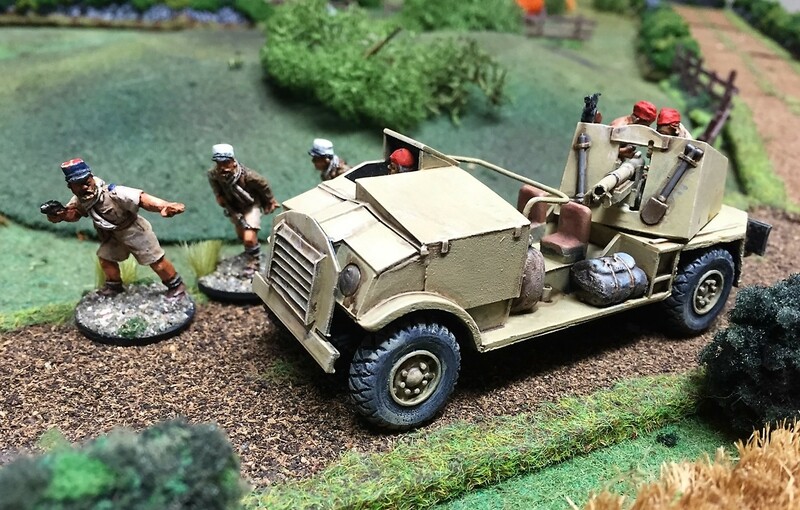 This is an old Hinchcliffe limber that I bought second-hand many years ago, but which then sat unloved and unpainted because I felt the figures didn’t match the look of my armies. But in 2014 I decided to paint it just to see how it would turn out, and was pleasantly surprised. I kept my painting fairly simple, as the figures don’t really have much detail. 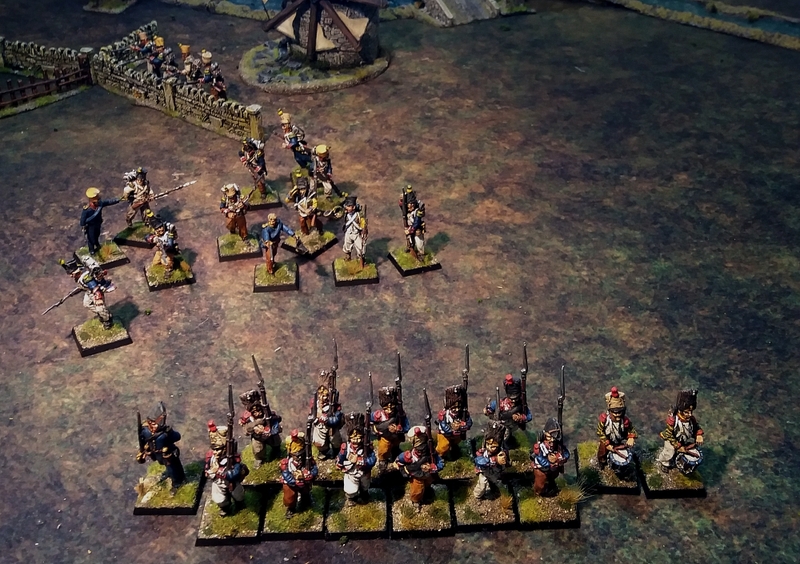 The figures are also smaller and slighter than my Perry and Front Rank armies – but by adding a higher base than my normal style, this isn’t too obvious from a distance. The horses also had rather odd anatomies, with very slender and high-slung bellies But once painted, this didn’t seem too noticeable either. On the other hand, the horse harness is simply superb. And the easy method of attaching the traces is something modern companies could emulate.